Do you want to see where the turbines are located in the amended project? The proposed turbines are 492 ft. tall, an important factor in considering how EverPower/Buckeye Wind plans to place their industrial machines. Click HEREfor the link to the map on the OPSB site. A huge thank you to Bob and Barbara Behling for representing the truth! 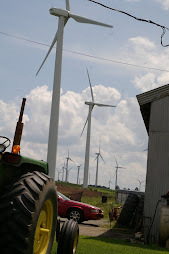 Fighting Big Wind Continues: A New Opposition Group Forms in Champaign County! After seven years of development, controversy and exhaustive legal examination, the two wind farms planned for Champaign County might soon be put on the scrap heap because of recent state legislation that discourages their construction. It’s too soon to say for certain because the proposed projects continue to be affected by ambiguity on many fronts, but EverPower’s comments to the Columbus Dispatchon Sunday sounded like the beginning of the end of Buckeye Wind. Four Champaign County political subdivisions applied to the Ohio Power Siting Board Thursday asking the board to rehear and reconsider an amendment to the first phase of the Buckeye Wind Farm project. The four entities seeking a rehearing are the Champaign County Commission and townships of Goshen, Union and Urbana. In their application for rehearing, the entities express concern about the board’s failure to set forth adequate protection for the county’s infrastructure and other interests related to the project’s development. Last month the board approved the amendment filed by project applicant EverPower last March. THE AMENDMENT TO THE BUCKEYE WIND PROJECT! Check out the official documents to the proposed amendment to the Buckeye Wind Project. This amendment combines what was formerly Phase I & II into a single project. Several significant changes are being proposed. For a summary of the originally approved Phase II: CLICK HERE. For detailed documents: CLICK HERE. For a summary of the originally approved Phase I: CLICK HERE. We are your neighbors: people who own property in Champaign County just trying to discover the truth about what installing industrial wind turbines will mean to our homes, land, and community. We live here. This is our home, unlike the Big Wind company proposing this project. So whose perspective do you think represents the best interests of Champaign County? With all the rhetoric about wind power on both a national and local level, it's hard to distinguish fact from fiction. On this site you will be able to read about and view videos that deal with what it is like to live in such close proximity to turbines. From residents, from doctors and from wind energy experts without ties to the wind industry.